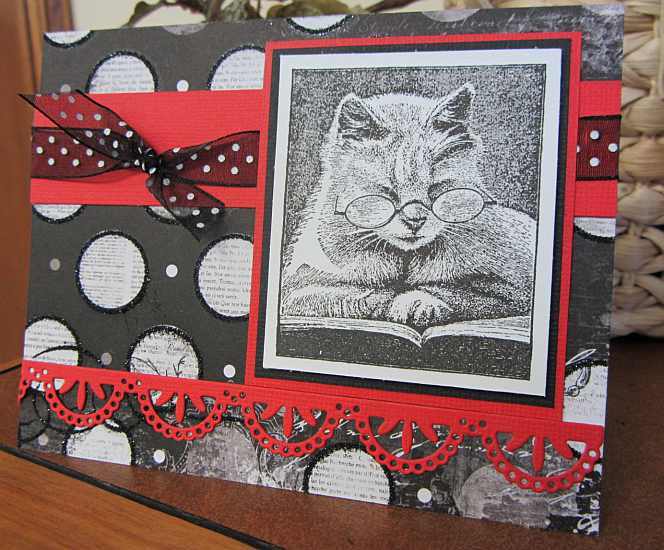 I made this card for Stampin’ Cat Studio to showcase this extremely CUTE cat stamp and the cool BoBunny paper. If you look closely you can see the black glitter on the paper. Very pretty. Lisa is still laughing at me and my reaction to the kitty! Thank you for your visit. This entry was posted on Wednesday, November 9th, 2011 at 6:00 am	and tagged with cardmaking, stamping and posted in Design Team, General Cards. You can follow any responses to this entry through the RSS 2.0 feed. Ha Ha, love that image and cool border design too! Now you know what I want for Christmas! I even think that cat looks like me. If I were a cat.